There are several occasions where you can serve this beastly snack, use it as finger food for Halloween, snack to your witches party, celebration of Walpurgis night or vampire party. The small bat party food can be used as appetizers or as nibblies you can even use the little Flapi snacks to decorate food – and remember, when bats are sleeping they are always head down. Our theme party right before Walpurgis night is a witches party, be it for children birthdays with the little witch and her Abraxas, Winnie the witch or Harry Potter's Hermione or if it is rather an Adult's party inspired by the bad witches from Roald Dahl, or the strong witches of Eastwick, the fantastic Morgaine, or the pretty witches and sisters from Charmed, the funny teenage Sabrina or the sweet bewitched Samantha or the practical magician Sally. 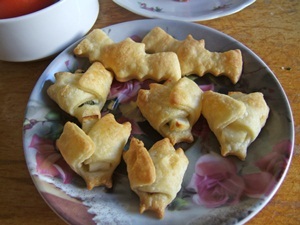 We prepare our bat snacks Flapi with quark pastry. 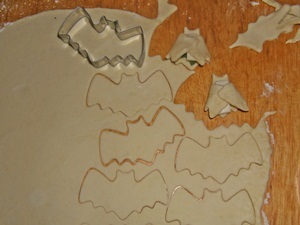 Cut out the dough with the bat cutters, cut pieces of cheese 3cm long, 1cm wide and 3mm high. Before you start filling the bats, preheat the oven to 170 degrees centigrade. Roll out, cut out and fill - that is even better with four hands. 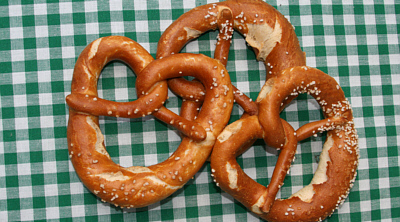 A recipe kids will love to help making. When filling the Flapis we combined feta cheese with rosemary and haloumi with sage. 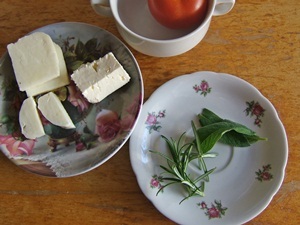 You can either cut rosemary and cover feta in it, or top every piece of feta with 1-3 needles. Roll sage leaves around the haloumi. Put some salt on the inside of the bat. Close the bat wings like a cloak or cape. Put the upper ends of the wings on top of the cheese. 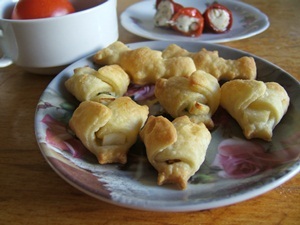 When using quark pastries you can put them together and roll them out again. If you are using puff pastry put the rest on top of each others and roll in one direction – if you just mix it you will loose the pastry-fat-layers and the flake pastry won't be flaky. Put the bats on a baking tray. If you#d like to you can coat them with egg. Leave them in the oven for 15-30 Minutes in the oven at 170 degree Celsius – the time depends on how thick the dough and how thick the Flapis are. Vegetarian, Mediterranean Vampires are best served with a blood red dip or a haunted morass sauce. For the blood red dip used sieved tomatoes some oregano and chili peppers. For the haunted morass sauce use sour cream, 1-2 table spoons pumpkin seed oil and 2 table spoons of chives. You can fill the Flapis with all kind of goodies like minced meat or small sausages or a mix of feta and bacon. As the dough is not salty, use some salt when making or serve with a well seasoned dip. If you are looking for a recipe of quick salty snacks, cut out bats and sprinkle grated cheese and salt. By the way World of Warcraft Fans will appreciate real bat bites as well. You would like to get more recipes and inspirations for food for birthday parties or magical snacks: Have you already seen our dragon soup for dragon parties and Halloween celebrations?